Ideal all purpose dry fly hook. 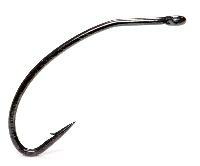 Traditional Sproat bend, forged wet hook ideal for lake and river fishing where exceptional strength is required. Wide gape, heavy wire streamer. Suitable for all types of traditional streamer, bucktail and long attractor flies. We form the points of each hook with our normal needle grinding method. The wire then goes through all the other stages to make it into a finished hook and it is then heat-treated. After that the hooks go through a process in which a chemical attacks the surface. The thinner parts of the wire are affected, the point in particular. The chemical smoothes or eats away the metal and, in effect, refines the point. This is quite a critical operation because if the chemical sharpening goes on too long it will eventually dull the point and may weaken the barb. Furthermore, if the chemical attacks one side of the point more than the other then the point will be weakened. Finally, it is important to remember that chemical sharpening will not make a weaker point into a strong one. It is more likely to make a suspect point even weaker! An all-round wet fly hook great for nymph, standard wet fly patterns and wake flies. The neat micro barb and strong sharp point give great hook ups. Black Nickel finish. Pack of 25.  At last an end to the time consuming task of fitting the gold head to the shank of the hook.  These are already fixed to a down eye, wide gape, medium shank wet fly hook.  25 hooks in a pack. Perfect for heavily dressed patterns or those that require additional buoyancy, such as boobies. These hooks also make great blob flies The wide gapee ensures that the point of the hook is not masked by the dressing. Black Nickel finish. Pack of 25. A double nymph hook that conforms to international rules and combines the traditional shape of a wet fly hook with the additional weight to get down to the fish. Black Nickel finish. Pack of 10. The original design for the tying of the world famous Klinkhamer nymphs designed by Hans van Klinken the originator of the pattern. Also good for many emerger/buzzer patterns Black Nickel finish. Pack of 25. The original design for the tying of the world famous Klinkhamer nymphs designed by Hans van Klinken the originator of the pattern. Also good for many emerger/buzzer patterns. Pack of 25. This hook is now exactly as designed by Hans van Klinken. It is now possible for us to make it according to the original plan. Pack of 25. The name says it all, a perfect dry fly hook Bronze finish. Pack of 25. Designed to offer a base for most standard wet fly patterns, a great allrounder Bronze finish. Pack of 25.  Wide gape down eye.  Great for standard wets.  25 in a pack. These medium weight 2X long shank hooks are often used for larger dry flies including mayflies, hoppers and other terrestrial imitations. Forged wide gapee bend. Bronze finish. Pack of 25. 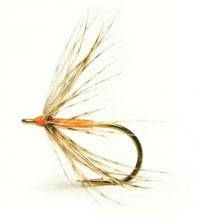 Sweeping bend for flies like caddis and emerger patterns. Straight eye. Black finish. Pack of 25. These grub/shrimp hooks were derived from a small fine-wire plain shank hook which was used in Italy for plastic bloodworm imitations. John Veniard, the world famous fly tier, and author, recognised their versatility, when Partridge developed them as fly hooks in 1976. They were given a down eye with an offset bend which made them good hooks and suitable for all types of grub, shrimp, curved body and some emerger patterns. Pack of 25.  Down eye medium weight.  Perfect wet fly hook.  Down eye wide gape.  A great dry fly hook. Oliver Edwards recommends these hooks in his book Masterclass. They were developed specially for his small nymph and emerger patterns, but they are also good for dry flies. The Silver finish reflects the colours of the sub-surface world of the Trout and Grayling. Straight eye. Pack of 25.  The smallest hook we make perfect for midge and caenis imitation.  Offset bend aids hooking in such small sizes. Captain Hamilton bend fine-wire wet fly hook ideal for Classic North Country spiders and soft hackle patterns.  Wide Gape hook with leaded body for tying weighted nymphs.  7 hooks in pack.